A useful utility for app developers or for providing tech support. First, the obvious: Unicorns has the best Mac app icon. Who doesn’t love unicorns? How can you hate on a unicorn Mac icon? OK, now that that’s out of the way, let’s talk about the app itself. Unicorns are magical mythical animals, and what the Unicorns app does could be considered magical: On a Mac, it allows you to view a stream of the screen of a connected iOS device, with no need to install any iOS software. Not only can you view the stream on your Mac, but you can also broadcast it over the Internet so others can watch. And Unicorns does all of this for free. Unicorns' user interface doesn't have much to it. After installing Unicorns on your Mac, plug your iPhone into your Mac with a Lightning cable. 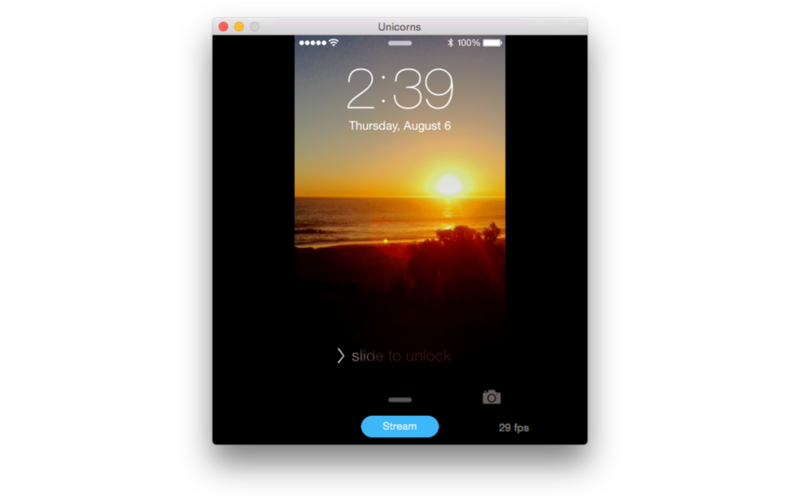 When you launch Unicorns, the app finds your iPhone and shows your iPhone screen on your Mac’s display. There’s a very slight delay between the iPhone and Mac, but it shouldn’t hinder you if you’re, say, doing a presentation and you’re speaking while using Unicorns. When you want to broadcast your stream on the Internet, tap the Stream button, and after Unicorns establishes an Internet stream, the app interface expands with a chat window. At the top of the chat window, Unicorn provides a URL that you can send to others so they can see your stream through a browser—but your audience members have to log in with a Twitter account in order to participate in the chat (no Twitter account is needed to watch the Internet stream). Streaming on the Internet works, for the most part, but there are some quirks you may have to deal with. While streaming, the delay was long, ranging from 15 to 45 seconds. If your iOS device’s auto lock kicks in, Unicorns seems to lose its connection and the only way to recover is to force quit the app—you should set your iOS device to never auto lock when using Unicorns. The Unicorns interface on the web allows you to type in chat comments. The Unicorns FAQ says that the app was the result of an experiment, “a fun side-project,” which explains Unicorns lack of features. For example, there’s no feature to let you record the stream to a file for archiving or future reference. 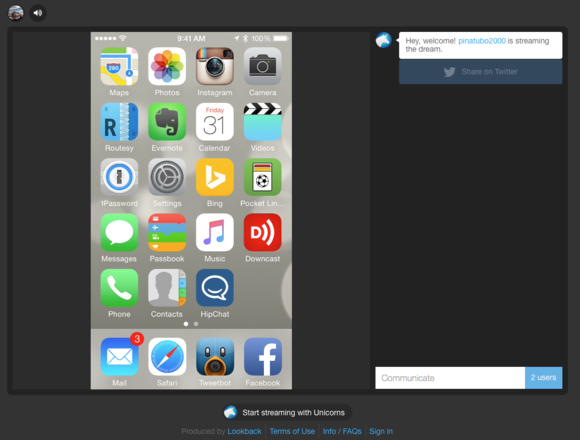 You can work around this by using a screen recording app like ScreenFlow. I used the screen recording feature in QuickTime Player, but this doesn’t record audio, only what’s on your Mac’s screen. Even with its quirks and lack of features, Unicorns is a useful utility. App developers can use it to demo their latest project, get feedback from other developers or clients, or other tasks that require collaboration. If you’ve been designated as the unofficial tech expert in your family, you can use Unicorns to help out a family member by showing how to do a particular task. And since it’s free, there’s really no risk in trying it out. Even with its quirks and lack of features, Unicorns is a useful utility.